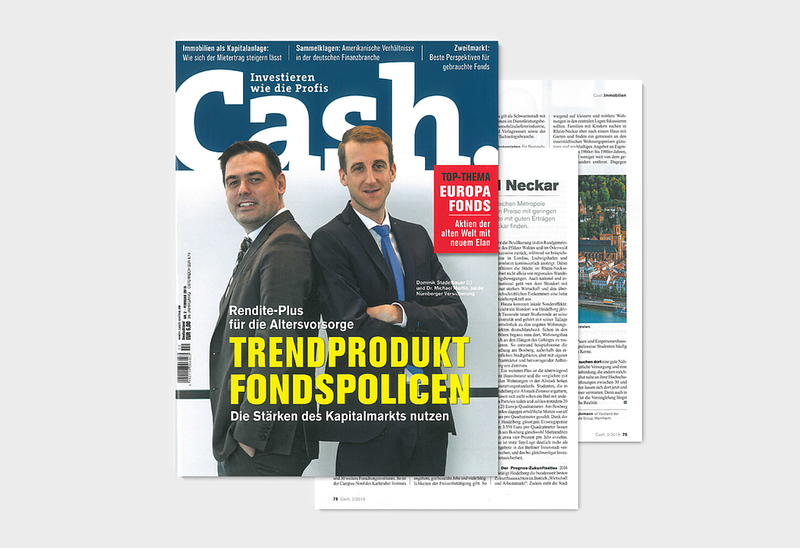 Cash magazine, Issue No. 2 | 2018 - Rent returns. Property investors who want to acquire a property in a German metropolis must settle for low returns due to the sharp rise in prices. But there are alternatives: Locations with good yields can be found in the economically strong Rhine-Neckar region. Berlin or Germersheim? The city on the Rhine crossing near Karlsruhe with 20,000 residents wouldn't even have the slightest chance in any city ranking. But those looking for a capital investment today should disregard sheer size, glamour and name recognition, and think in other contexts. For example, the available household income in Germersheim is currently four percent above the national average. The capital city is 14 percent lower, while housing vacancy is equally below three percent and immigration is a good one percent per annum. And also in the labour market, there are many good reasons to invest in real estate in the southern Palatinate district town. At present, only 3.8 percent of the working-age population is unemployed. In Berlin, they are happy if it slips below the ten-percent mark for a few months. The reason for the good economic and housing market data is the location of Germersheim in the Rhine-Neckar metropolitan region in the border triangle between Rhineland-Palatinate, Baden-Württemberg and Hesse. The area includes the cities of Mannheim (306,000 inhabitants), Ludwigshafen (167,000) and Heidelberg (165,000) and their surrounding areas, the rural Neckar-Odenwald district and southern Palatinate with cities such as Worms or Speyer. Ten of the top 100 listed companies are headquartered in the region. In addition to global corporations such as BASF, SAP, Roche, Heidelberger Druckmaschinen, Heidelberg Cement, KSB or Fuchs Petrolub, many medium-sized companies, hidden champions and innovative start-ups are located in the region. These in turn benefit from a variety of scientific facilities, including 23 universities and 30 other research institutes. The north campus of the Karlsruhe Institute of Technology with its 3,600 employees is only half an hour away from Germersheim. And BASF's parent plant in Ludwigshafen with just under 40,000 job positions can be reached in just under 45 minutes. 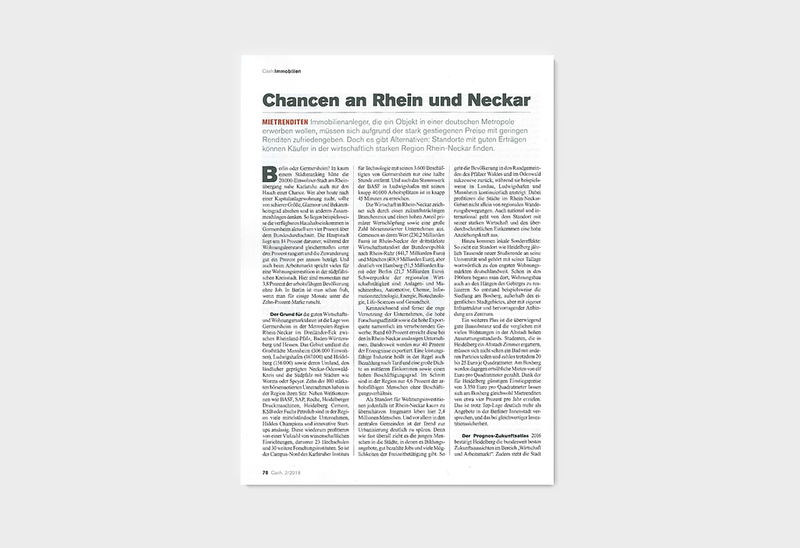 The economy in Rhine-Neckar boasts a promising sector mix and a high proportion of primary added value as well as a large number of listed companies. Measured by its value (230.2 billion euros), Rhine-Neckar is the third strongest business location of the Federal Republic after Rhine-Ruhr (441.7 billion euros) and Munich (418.9 billion euros), but well ahead of Hamburg (51.5 billion euros) or Berlin (21.7 billion euros). The main areas of regional economic activity are: Mechanical engineering, automotive industry, chemistry, information technology, energy, biotechnology, life sciences and health. The close networking of companies, the high degree of research affinity and the high export quota, especially in the manufacturing sector, are also characteristic of the area. The companies based in the Rhine-Neckar region achieve around 60 percent here. Nationwide, only 40 percent of the products are exported. A high-performance industry usually also means paying by tariff and a high density of middle income as well as a high level of employment. On average, only 4.6% of the working-age people in the region are unemployed. 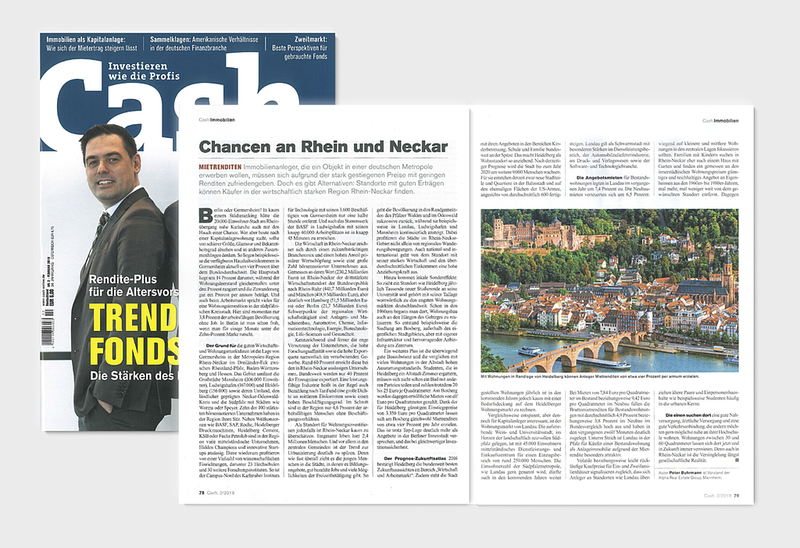 In any case, Rhine-Neckar can hardly be overestimated as a location for housing investments. A total of 2.4 million people live here. And especially in the central community, the trend towards urbanisation is clear. Because, like almost everywhere, young people are drawn to the cities where there are educational opportunities, well-paid jobs and many opportunities for leisure activities. The population in the peripheral communities of the Palatinate Forest and in Odenwald, for example, is gradually declining, while it is steadily rising, for example, in Landau, Ludwigshafen and Mannheim. The cities in the Rhine-Neckar region not only benefit from regional migration movements. The location is also highly attractive nationally and internationally with its strong economy and above-average income. In addition, local special effects come into play: For example, a location like Heidelberg attracts thousands of new students to its university every year and, with its valley location, is literally one of the narrowest residential markets in Germany. The construction of housing even on the slopes of the mountains began in the 1960s, for example, in the settlement in Boxberg, outside the actual urban area, but with its own infrastructure and excellent access to the centre. Another plus is the predominantly good building structure and, compared to many apartments in the old town, high furnishing standards. 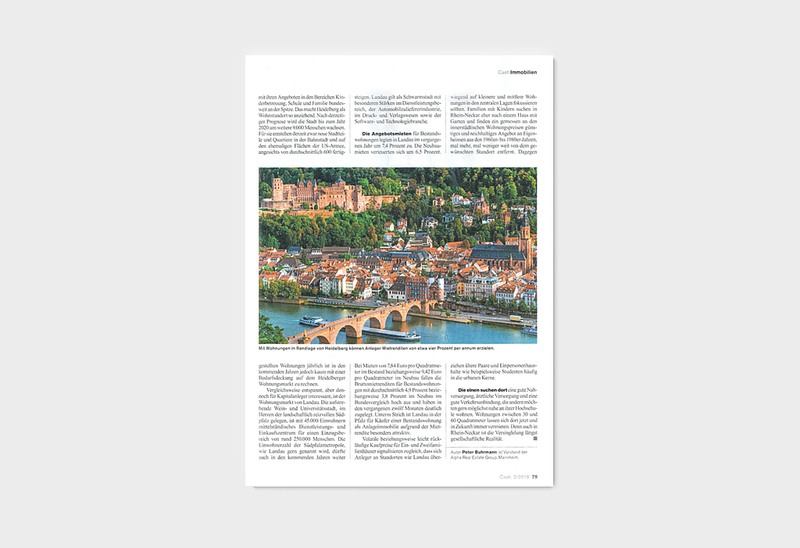 Students who get a room in the old town in Heidelberg often have to share a bathroom with other parties and still pay 20 to 25 euros per square meter. In Boxberg, on the other hand, rents of eleven euros per square meter are usually paid. Thanks to the prices of 3,350 euros per square meter, which are favourable for Heidelberg, rental rates of around four percent per year can nevertheless be achieved in Boxberg. Despite the top location, this is much more promising than what the centre of Berlin offers, and that with the same level of investment security. The Prognos Future Atlas 2016 confirms Heidelberg as having the best prospects for the future in the field of 'Economy and the Labour Market’ in Germany. In addition, the city is at the top nationwide in terms of offers in the areas of childcare, school and family. This makes Heidelberg very attractive as a residential location. According to current forecasts, the city will grow by another 9,000 people by the year 2020. Although new districts and neighbourhoods are currently being built for them in the ‘Bahnstadt’ and the former areas of the US Army. In view of an average of 600 completed apartments annually, they are unlikely to meet the demand on the Heidelberg housing market in the coming years. The housing market in Landau is relatively relaxed, but still interesting for investors. The up-and-coming wine and university town, located in the heart of the scenic South Palatinate with its 45,000 inhabitants is a medium-sized service and shopping centre for a catchment area of around 250,000 people. The population of the southern Palatinate metropolis, as they like to call Landau, should continue to increase in the years to come. Landau is considered a 'swarm city' with particular strengths in the service sector, the automotive supplier industry, in the printing and publishing industry as well as in the software and technology industry. The asking rents for existing apartments in Landau increased by 7.4 percent last year. Rents for new buildings increased by 6.5 percent. With rents of 7.84 euros per square meter in existing buildings or 9.42 euros per square meter in new buildings, the gross rental returns for existing apartments at 4.9 percent and 3.8 percent in new buildings are high compared to the rest of Germany and have clearly increased over the past twelve months. Overall, Landau in Palatinate is particularly attractive to buyers of an existing apartment as an investment property due to the rental yield. Volatile or slightly declining purchase prices for one- and two-family houses at the same time signal that investors in locations such as Landau should focus predominantly on smaller and medium-sized apartments in central locations. Families with children are more likely to look for a house with a garden in the Rhine-Neckar area and find a plentiful supply of - compared to the inner-city housing prices - reasonably priced private homes from the 1960s to the 1980s, sometimes further, sometimes closer to the desired location. In contrast, older couples and one-person households such as students often move into the urban core. Some are looking for good local amenities, medical care and good transport links, others would like to live as close as possible to their university. Apartments between 30 and 60 square meters can be rented there now and for the foreseeable future. Because in the Rhine-Neckar area, being single has long been a social reality.